The ocean is home to some of the most beautiful creatures in the world—and also some of the weirdest. A New Zealand family on vacation in the Bay of Islands found that out firsthand when they encountered a squat black fish that seemed to have legs. The family decided to bring their find to an aquarium in Auckland. Unfortunately, the fish died in its saltwater tank before that could happen. Not wanting to let the fish go to waste, the family sent its frozen body to the Museum of New Zealand Te Papa Tongarewa. The museum was only too happy to receive it. After inspecting the fish and analyzing a tissue sample, museum scientists were sure they were looking at an Antennarius striatus—a common bottom-dweller also known as the striated frogfish or hairy frogfish. Hairy frogfish are found all over the world, in both the Atlantic and Pacific oceans. They’re typically orange, yellow, or brown, but black variations aren’t unheard of. Frogfish use their leg-like pectoral fins to amble along the ocean floor. And while they may look silly, they’re actually quite deadly. When prey approaches, Antennarius striatus wiggles its namesake antenna-like appendage, luring the other animal closer. As soon as it's in range, the hairy frogfish pops its mouth open. Its jaws open so quickly that the other animal is actually sucked in along with the surrounding water. Though the museum appreciated this find, it's not wise to bring live animals home unless you have a permit to collect them. 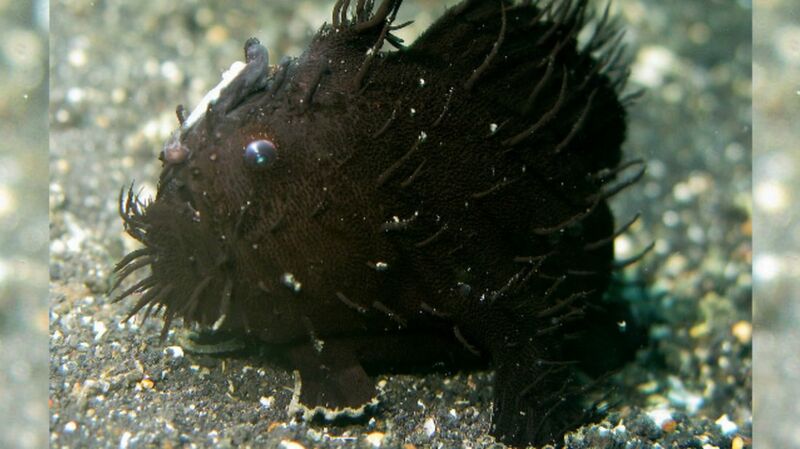 What looks to a layperson like a rare species may turn out to be nothing more than a common critter, and being taken from the water certainly didn’t do this frogfish any good.